Don’t Pitch It – Fix It! is a community repair workshop in partnership with the City of Winter Park and the City of Orlando. The workshop gives residents the opportunity to have broken items repaired by handy neighbors and skilled volunteers. Don’t Pitch It, Fix It! workshops help to achieve Orange County’s goal to significantly reduce landfill waste by 2040. Repair volunteers will try to fix eyeglasses, clocks, clothing, jewelry, watches, lamps, tools, electronics, small appliances, and bicycles. Residents need to bring parts that may be unique to their item, such as tubes for bicycle tires or patches for clothing. There is no cost for repairs at this event. 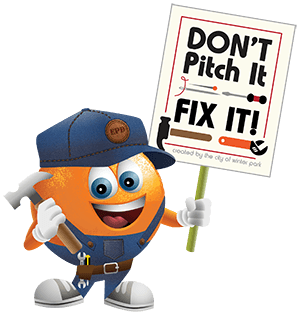 There are two ways to participate in Don’t Pitch It, Fix It!